* I just bought Amy’s Potions & Concoctions pdf booklet. It’s really great. I’ve already been using her deodorant for the last 18 months and I love it. It still sweat a little bit in the summer, but who doesn’t in So.AZ heat?! I’ll be making the hairspray (I normally don’t use any, but I thought it would be nice to try & play with ),magic teeth cleansing solution, herbal toner, facial oil and bugs don’t bite me balm. Many of the other recipes will be saved for cold season. 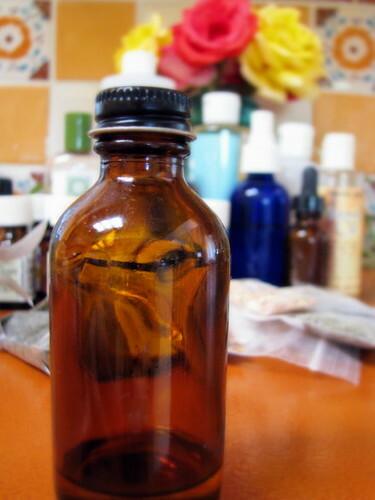 * I just recently learned about OCM (oil cleansing method), I had to try it out. I have to say that IT-IS-DIVINE! I’ve been cleaning my face this way for about a week and my skin feels soft and actually looks glowing (if I do say so myself). Normally, I have oily skin in the t-zone with some minor blemishes. I really like how this make my skin feel, not oily at all, just soft and healthy. * Next, I want to go shampoo free! I tried last year, cold turkey, with horrible results. My hair had a horrible transition period and I gave up. Since then I have been using this shampoo bar, which I really like. I also stopped washing on a daily basis. I’ve always felt I had to because my hair would feel greasy after one day. Now, I feel I can start again, hopefully without the dramatic transition period. If I need to, I will still wash with my shampoo bar, gradually weaning myself off completely over a period of time. SO–many–people have had wonderful results with this method. It’s really quite fascinating and I’m excited to give it another go. * Lastly, I just signed up forVintage Savoir Faire’s Summer 2010 Grow-a-long, which involves growing 3 plants (mint, thyme & chamomile-plus a bonus plant) then using these plants to make an assortment of different herbal recipes/remedies. Sounds fun, don’t you think? Hop over to sign -up. This entry was posted in Grow, Misc stuff and tagged angry chicken's potions & concoctions, grow-a-long, herbs, homemade deodorant, no shanpoo, no-poo, OCM, oil cleansing method, plants, shampoo free. Bookmark the permalink. Do you have any tips on what I can use for a nice face cleaning? I don’t like to use soap, a face mask or somthing along the lines of that. Also, any tips I could use for “hot flashes”, would help, I’m starting with the night sweats and I was told “rose hips” would help. Any Suggestions?? I gave up shampoo in December 2007, alongside with giving up my hairbrush and my straightening iron. This has been the best thing I ever did for my hair. I steel feel amazed by how many people feel that shampoo is so essential for a beautiful hair, how fooled we all get. I’ve thought about shampoo free but I haven’t yet taken the plunge . . . I don’t know if I could make it through the week or more that it takes. Also, I know it’s not great for the environment, but I just started using MK face wash and moisturizer and my skin feels and looks great. I turn 29 tomorrow, so I’ve been thinking a bit more about wearing sunscreen and taking better care of my skin. I’ll have to try the potion you mention here. I did the oil cleansing for a month- it felt great. Then my face broke out and never truly cleared up- very weird. I wonder how often the oil needs to be changed? My hair person said vinegar can take color off if you dye, but I shampoo a lot less- often just rinse/massage. It works well. Are you planning to come to No Cal this year? I really love Karma Komba solid shampoo from Lush. It’s awesome. I love that you are going to go shampoo-free though. That’s great! I’m about ready to try no-poo again. I gave up, similar to you, and have been trying various more natural shampoos – I did manage to decrease to washing every 3 days, but that’s all I can manage before its greasy-stringy-city. I wish I could find someone with my straight fine hair to compare notes with… good luck and let us know how it goes.